A huge cash flow into banking and securities shares in the final minutes of Tuesday’s session on the local stock exchanges drove shares up, with the VN-Index finally exceeding the short-term peak of 1,130 points. The benchmark VN-Index on the HCM Stock Exchange advanced 0.62 percent to close at 1.133,31 points, totaling a two-day rise of 0.88 percent. According to BIDV Securities JSC (BSC), the VN-Index surpassed the peak with the dynamics from the smart cash flow. “Positive market sentiment will likely pull the index up in the next session. However, the risk still exists when the division tends to spread and liquidity has not really broke through,” BSC said. The minor HNX Index moved up 0.47 percent to end at 129.66 points. The northern market index advanced 1.16 percent to end at 129.06 points on Monday. More than 289.09 million shares were traded on the two local bourses, worth VND7.9 trillion (US$348 million). On the two stock markets, the market breadth was negative with 268 declining stocks against 214 gaining ones, while 249 other shares ended flat. The UPCOM Index on the Unlisted Public Company Market (UPCoM) fell 0.09 percent to 61.31 points, totaling a two-day lost of 0.19 percent. Foreign investors today were net buyers of VND184.18 billion on HOSE, focusing on VRE (VND213.64 billion), VIC (VND57.45 billion) and VNM (VND28 billion). In addition, they net sold VND4.95 billion on the HNX. 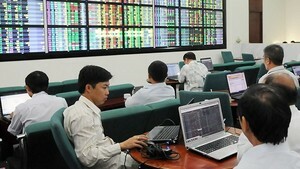 The banking and securities sectors indices jumped 1.65 percent and 1.67 percent, respectively, data on vietstock.vn showed. Vietnam Joint Stock Commercial Bank for Industry and Trade (CTG) is the most noticeable among banking shares that contributed to Tuesday’s gain, up 6.7 percent, followed by Vietnam Prosperity Joint Stock Commercial Bank (VPB) and Military Commercial Joint Stock Bank (MBB), up 2 and 2.7 percent, respectively. 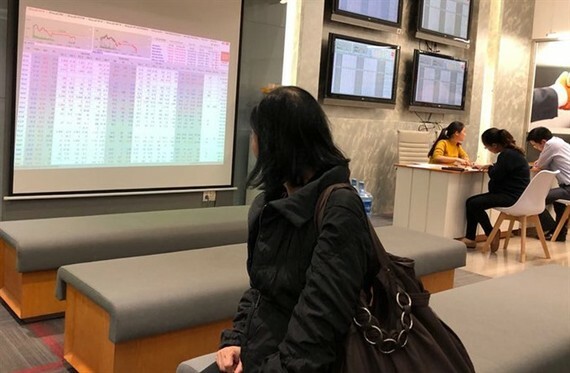 Blue-chips in the brokerage sector also rallied, including Saigon Securities Incorporation (SSI), gaining 2.86 percent, Ho Chi Minh City Securities Corporation (HCM), rising 5.46 percent and VNDirect Securities Corporation (VND), up 1.8 percent. According to Bao Viet Securities Company (BVSC), market sentiment is forecast to stay cautious in the next sessions as investors are waiting for the review of the two ETFs this weekend. The market is likely to continue its sideways movement amid wide divergence. Meanwhile, according to Viet Dragon Securities Co (VDSC), the VN-Index continued to fluctuate strongly within the session, which might be interesting for risk-seeking investors. As for risk-averse ones, we recommend to monitor market moves and wait for clearer opportunities.